Fig. 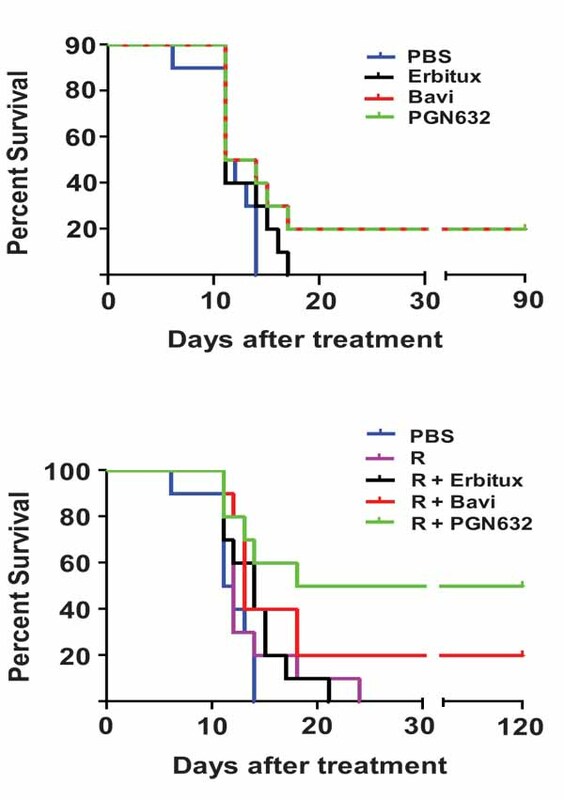 (4) Survival of guinea pigs after lethal infection with Pichinde virus and PGN632 therapy and/or ribavirin. (a) Without ribavirin: guinea pigs (n=10) were infected with 105 PFU of Pichinde virus (approx. 103 lethal doses) and, starting 4 days later, were treated with PGN632 (6 mg/kg) i.p. three times a week for up to 3 weeks. X2 = 5.8543; degrees freedom = 3; p = 0.1189. (b) With ribavirin: the experiment was performed as in (a) except that the guinea pigs also received ribavirin (3.25 mg/kg, i.p.) daily for 10 days. Bavituximab was used as a positive control and erbituximab as a negative control. Surviving guinea pigs were re-challenged with 105 PFU of Pichinde virus i.p. on day 60 (a) or day 90 (b) and were immune. The results are representative of two separate experiments. X2 = 14.6542; degrees freedom = 4; p = 0.0055.